Adopt-A-Dog, a nonprofit shelter and sanctuary for rescued cats and dogs in New York and Connecticut, has received a $25,000 gift from Pet Pantry Warehouse that will contribute to the production of the organization's 25th anniversary "Puttin' on the Dog" fundraising and adoption event, to be held Sept. 23. The donation will also help Adopt-A-Dog rescue more animals in need and consequently raise awareness regarding the plight of abandoned animals. The Pet Pantry Warehouse is an award-winning, family-owned pet supply retailer with locations in Larchmont, N.Y., Rye, N.Y., and Greenwich with stores opening soon in New Canaan and Wilton. It has supported Adopt-A-Dog since its inception 30 years ago. 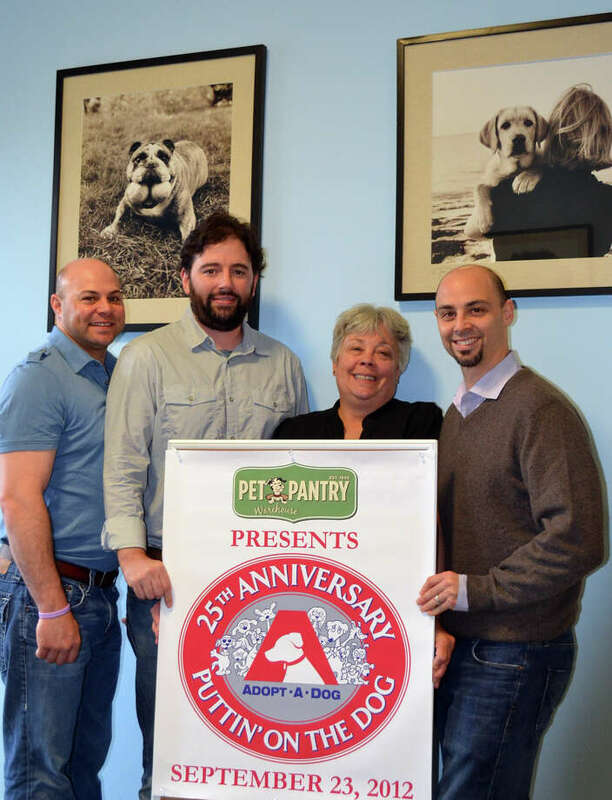 With this gift, Adopt-A-Dog also announces its 25th anniversary logo, with Pet Pantry as its presenting sponsor. "In the years that we've been supporting Adopt-a-Dog, we are always amazed by the wonderful work that is being done to rescue animals that would otherwise be abandoned and uncared for," Pet Pantry Warehouse Executive Vice President Adam Jacobson said. "We are delighted to be the official sponsors of this fun event and to support this wonderful organization." Pet Pantry Warehouse is the pet product sponsor of P.O.D. The day-long festival, which will take place at Roger Sherman Baldwin Park in Greenwich, will include dog competitions, a Pet Pantry pavilion, auctions, an inventory of dogs and cats for adoption, demonstrations, a children's entertainment area and more. The event begins at 10 a.m. and ends at 5 p.m.
"We are thrilled to receive this generous donation from Pet Pantry Warehouse," Adopt-a-Dog President Allyson Halm said. "Its commitment to our organization and its dedication to the welfare of animals is commendable. We are forever grateful for their support, knowing that hundreds more dogs and cats will end up in good homes as a result of this gift." Adopt-A-Dog is accepting P.O.D. sponsorships at all levels and is also offering a variety of sponsorship packages for both individuals and corporations. Sponsorships are structured to show quantitative return on investment tailored to the nature of each sponsors business. For more information on how to become a P.O.D. sponsor, contact Frank Taylor at 203-761-6785 or email frank@onebrainmarketing.com . If you're interested in providing a forever home to an adoptable dog or cat, call 914-273-1674 to schedule an appointment for a shelter visit. Visit www.adoptadog.org . Adopt-A-Dog is a nonprofit humane animal shelter, rescue, and sanctuary founded in 1981. Since its inception, Adopt-A-Dog had aided in the placement of more than 13,000 companion animals in Westchester County, N.Y., and throughout the United States. Known for its longtime staff of animal advocates and innovative adoption procedures, Adopt-A-Dog aims to reform the animal welfare industry and educate future pet owners to promote lifetime ownership and care. The shelter's strong educational component sets the standard for animal rescue and placement, of which they boast a 95 percent success rate. The year 2012 marks the organization's 25th anniversary of Puttin' on the Dog, its annual fundraising and adoption event, which benefits upkeep of its shelter and care of its adoptable dogs and cats. Adopt-A-Dog's headquarters is located in Greenwich and its shelter is located on two acres in Armonk, N.Y. The Pet Pantry Warehouse is a pet supply retailer that has been serving the Greenwich community since 1945. A full line of holistic and natural pet foods are available as well as accessories. Visit www.ppwpet.com .